We are excited to announce that Tracy Macdonald Mendez, MPH, MPP will be the new Executive Director of the California School-Based Health Alliance (CSHA) starting November 26, 2018. Tracy has a long, rich history of working in school-based health centers (SBHCs) dating back to 1996. With over 25 years of public health experience, she has held numerous managerial and leadership positions in SBHCs, adolescent health, community health centers, health policy, and the health care safety net. She spent over 16 years as an operations manager and director at La Clínica de La Raza, the Bay Area’s largest federally-qualified health center (FQHC) and one of the state’s leaders in providing school-based health care. With her demonstrated commitment to school health and her deep knowledge of SBHC and FQHC operations and financing, Tracy is well positioned to lead CSHA’s mission to put health care in schools. She cares deeply about the experience of on-the-ground providers and the role CSHA plays in supporting them and the growing school-based health care movement. Tracy’s vision for expanding school-based health care is driven by her dedication to health equity and social justice. Her leadership and focus on reducing health and education disparities will help CSHA serve the field and support children and youth across the state, particularly those living in underserved areas of California where access to care is needed most. We invite you to join us in welcoming Tracy as the new Executive Director of the California School-Based Health Alliance. We’d also like to thank Amy Ranger, Acting Executive Director, for her dedication and interim leadership, who will continue at CSHA as Director of Programs. We look forward to continued growth and support for our school-based health partners across the state. The Board and staff of the California School-Based Health Alliance (CSHA) are proud of the work we have done in the past year to grow the school-based health care movement across the state. In a time of great uncertainty about health care, the Alliance has worked to secure its place as a leader in the field. We will continue to pursue opportunities to strengthen the Alliance and deepen our commitment to the health and success of California’s children. Today we announce that Judy Appel, Executive Director, has resigned to pursue an unexpected opportunity to run for California State Assembly (District 15). The recent announcement by Assemblymember Tony Thurmond to run for California State Superintendent of Public Instruction created the chance for Judy to continue her service to her community in a new capacity: the State Assembly. Judy remains committed to the mission of CSHA, and the Board and staff applaud her dedication to public service. We recognize the need for a full-time, permanent executive director to lead CSHA and build on the momentum and success of the school-based health care movement. As we initiate a nationwide search for a new executive director, the Board and staff are developing an interim plan that will ensure the continued, smooth operation of the Alliance. CSHA continues to play a pivotal role in putting health care where kids are—in schools. The commitment of our members, funders, and the communities we serve continues to be the bedrock that allows us to make exciting and important changes that drive the school-based health care movement forward and improve the health and success of children across California. The Fresno Unified School District Board of Supervisors on February 8, 2017, approved six new school-based health centers (SBHCs) to benefit nearly 7,000 students. Students “benefit from having quality health care, which keeps them in school longer, makes them more successful, and immediately impacts their learning,” Acting Fresno Unified Superintendent Bob Nelson said at a press event announcing the plans to build the new SBHCs. Fresno opened its first school-based health center at Gaston Middle School in 2014. Kaiser Permanente Northern California Community Benefit provided generous support to facilitate the planning of the new SBHCs in partnership with Fresno Unified. 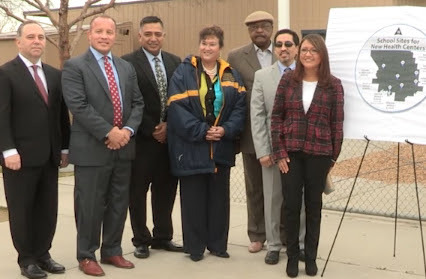 The six new sites will be operated in partnership with Clinica Sierra Vista and Valley Children’s Healthcare and are planned for Addams and Bakman elementary schools; Tehipite and Sequoia middle schools; and Duncan Polytechnic and Sunnyside high schools. California School-Based Health Alliance Project Director Salina Mendoza provided Fresno Unified with background on the values of school-based health care, and partnered with Kaiser Permanente, Clinica Sierra Vista, and Valley Children’s Healthcare on planning the new sites. See more in a video of the press event and on the Fresno Bee website. We have very exciting news to share about the “free care rule” reversal that reopens a critical avenue of reimbursement for Local Education Agency (LEA) school health providers. 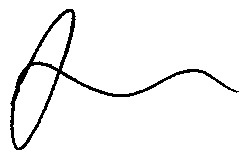 The Department of Health Care Services (DHCS) announced on August 29 that changes to the provider manual for the LEA Billing Option Program will reflect the most recent policy direction from the Centers for Medicare & Medicaid Services (CMS) regarding “free care.” The draft changes to the manual are available for review and should be officially published later in September. This exciting anticipated change to the LEA Billing Option program ensures that Medi-Cal may reimburse LEA providers for services provided to Medi-Cal eligible students, even if they are not in special education. We hope that everyone providing health services in schools will learn about this opportunity to draw down more revenue to create robust school health systems that include both school districts and community providers. You can learn more about the “free care” policy, the LEA Billing Option program, and CMS’s policy change on our Free Care Rule page. We have been working closely with DHCS, LEAs, the California School Nurses Organization, and other advocates to make sure that our state makes changes to the LEA program to strengthen school-based health care. The California School-Based Health Alliance Board of Directors has named Judy Appel as the new executive director to lead our organization. Judy starts on September 19 and is excited to join us at a moment of incredible opportunity to build more support for school-based health care. Our Board of Directors chose Judy after a comprehensive search process because of her strong experience leading a regional nonprofit to statewide and national prominence. Judy has served since 2005 as the executive director of Our Family Coalition, which is based in the Bay Area and advances equity for lesbian, gay, bisexual, transgender, and queer (LGBTQ) families with children through support, education, and advocacy. She has led policy victories for Our Family Coalition, including the Welcoming and Inclusive Schools Program that guides schools to create more welcoming environments for LGBTQ families, and LGBTQ inclusion in the new history-social science curriculum framework recently adopted by the State Board of Education. She is also involved in statewide policy efforts on ending the school-to-prison pipeline. Judy serves on the Board of Education for the Berkeley Unified School District, where she oversees a complex budget of $135 million; guides policy direction for instruction and programs; supports physical and mental health services for students; and leads Board efforts to implement restorative justice, social emotional learning, and trauma-informed practices at school sites. In addition, she is involved with numerous initiatives aimed at improving education and health equity for all students, including the Restorative Practices Advisory Committee, the Berkeley Unified 2020 Vision Leadership Team, and the Fix School Discipline Policy Coalition. We are pleased to welcome Judy as we begin a new phase of growth for the California School-Based Health Alliance and school-based health care in California! Attorney General Kamala Harris raises awareness about poor elementary school attendance in California and calls for action. When students are chronically absent from elementary school, they fall behind academically, they are less likely to graduate from high school, and they are more likely to be unemployed and on public assistance. 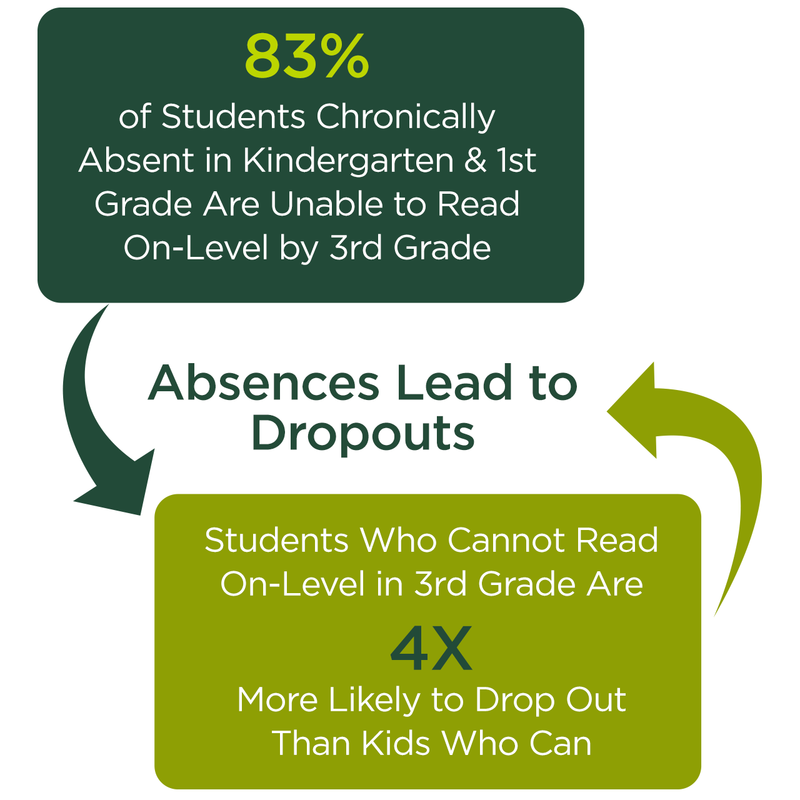 Putting kids on a path to success requires attention to student attendance, particularly in the early years. Research shows that early school attendance is a critical building block to a child’s success. Read more about the causes of chronic absence. Attorney General Kamala D. Harris has made reducing elementary school truancy and chronic absence a priority. As part of this effort, the Attorney General released an annual report, In School + On Track, to disseminate effective practices for reducing student absences, to track changes in statewide attendance rates, to raise awareness about the critical importance of elementary school attendance, and to call others to action. The 2015 report includes new and updated data on the still alarming rates of elementary school truancy and chronic absence across the state. More than 1 in 5 elementary school students in California are truant based on data from the California Department of Education. An estimate of 8% of elementary school students in California are chronically absent. That means over 230,000 of our youngest students are already at risk of falling behind in school. Data also shows that there are disproportionately high rates of absenteeism and suspensions for students of color, low-income, homeless, foster youth and special education students. There is also a positive trend across California: increased attention and more concerted efforts to improve elementary school attendance. The 2015 report highlights some of the districts and counties engaged in this important work. The California School-Based Health Alliance applauds the Attorney General for continuing to draw attention to the issue of chronic absence in California. We know SBHCs make a huge difference at the schools they serve in addressing the underlying health issues that may impact attendance. Check out some of the ways that SBHCs are making a difference. Serena Clayton, Executive Director of CSHA, and Fred Blackwell, CEO of The San Francisco Foundation, at the grant announcement in Oakland. The California School-Based Health Alliance (CSHA) received a $2 million grant July 14 from The San Francisco Foundation to support trauma-informed care in 15 school-based health centers in Oakland Public Schools. CSHA is one of 17 Oakland-based nonprofit community-based organizations receiving funding as part of a $34 million gift made to The San Francisco Foundation from an anonymous donor in 2015. Read more about the anonymous gift. “For young people who grow up in communities where violence and instability are a way of life, trauma can have a profound impact on motivation, school performance, and life options. Trauma results from, and contributes to, the glaring social inequities that face our communities,” said Dr. Serena Clayton, Executive Director of CSHA. “We are grateful to the San Francisco Foundation and its donor for their confidence in us and in the potential of school-based health centers to achieve transformational change in the lives of young people,” said Clayton. The grant will enable CSHA to build supportive environments and services to help students cope with high levels of trauma. CSHA will be engaging school-based health centers in implementing schoolwide screenings, support groups, trauma-informed care, and support for teachers. Click to expand a map of the impact this grant will have on Oakland Schools. 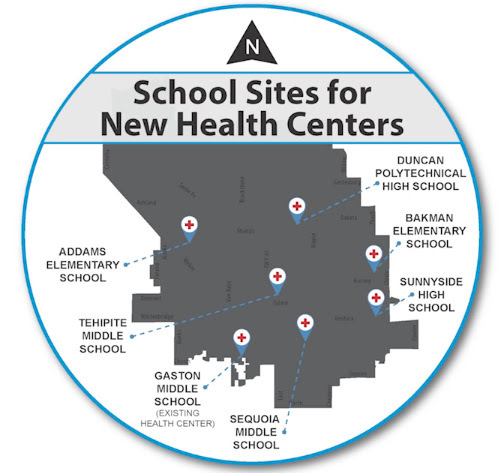 School-based health centers bring medical and mental health professionals directly on to school campuses where they are in close proximity to both students and school staff. This proximity leads to unique opportunities for teachers, students, families, and medical and mental health providers to work together. CSHA will share lessons learned throughout California and nationally.